Mike Wooldridge presents the final part of his Heart and Soul series for the BBC World Service, featuring people who have faced almost impossibly difficult life choices – and resolved them at great personal cost. His guests in this edition are Esther Ibanga and Khadija Hawaja Gambo, a Christian pastor and a Muslim community leader. Both are from the city of Jos in the Middle Belt of Nigeria, a part of the country that has been riven by sectarian strife for many years. When Esther and Khadija first met, they were very wary of each other – the mutual prejudice of their respective communities was running far too deep. Yet eventually they did talk – and overcame their own misgivings to stand together for peace and against politicians seeking to sow sectarian division for their own gain. 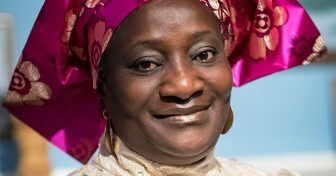 They are now co-operating on the Women Without Walls Initiative, an NGO that promotes dialogue between Muslim and Christian women in their part of Nigeria and has received no fewer than 13 international awards for its outstanding work. Their choice has not been an easy one: there are vested interests that do not want to see them making peace. Yet, they say, their faith carries them through: “God is the one who protects me”, says Esther. You can listen to the story of Esther and Khadija here.